Going to Dubai for the weekend was fantastic, but it did not help in the progress of my projects! This week’s chart on this challenge was worked on Sunday. The border on the sleeve was completed yesterday. With this the left sleeve is ready. Hoping to start on the right sleeve today. We have a new stitch on TAST 2016 challenge. It is a decorative variation of buttonhole stitch which goes by the name ‘fancy bobbin edging’ the working of this stitch is on Pintangle. In two minds to work the samples as band sampler or on a design. Anyway looking forward to work this stitch. This week’s chart was completed on Saturday. The cross stitch alphabets are really interesting to work with variegated thread. I managed to work the three motifs on one sleeve during this week. Now started on the border. Though the project is a long one, making some progress has brought back the enthusiasm, which was at the beginning of this project. Yesterday on TAST 2016 challenge SharonB has combined two week’s stitches into one- Long tail chain plain, beaded and whipped. These samples were worked in 2014. The links to the details are here. In the meantime, I am just toying with some ideas on the next project. This week’s chart also was completed on time. The alphabets are quite interesting. Looks like the work on this tunic will go on forever. The sleeves were embroidered with blue thread during this week. Each sleeve has three motifs and a border. I am becoming restless to complete the work on this tunic. Started this work knowing fully well it will consume time, knowing and experiencing are to different things. Trying to move around things around the house, reading a book on Lagartera embroidery, are the present diversions from this project. If I get away from this project and work on something else, it will never get completed. What a dilemma! 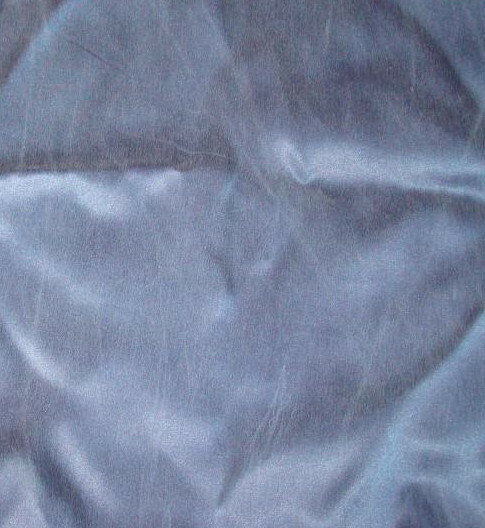 The pink and blue raw silk tunic was completed. My friend is quite happy and proud. it is a good feeling to see the pleasure in another person’s eyes. This week’s chart on Randje per week 2016 challenge was completed on Saturday, the day it was posted. The progress is quite slow on this tunic. Another motif was completed on the front of the tunic. Though it is chain stitch filling in one colour at this time [the stitches in blue thread was worked first], and I work for two hours in a day, the progress is very slow. We are still working on the pink and blue raw tunic for my friend. Double cross stitch variations with beads are worked over evenly placed marks on the sleeves. This week’s chart on Randje per week 2016 challenge was completed on Saturday. The alphabets had some ‘O and ‘X’ missing on them. I completed a motif on this tunic. Anchor # 20 red is the main colour. Blue is used to break the monotony. Now it is time to start on the yoke which is medium sized. 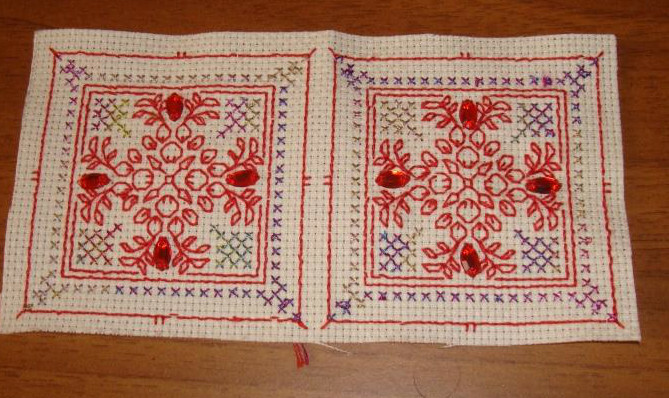 After working the motif, an idea came to work the chain stitches really small, resembling the Aari work. 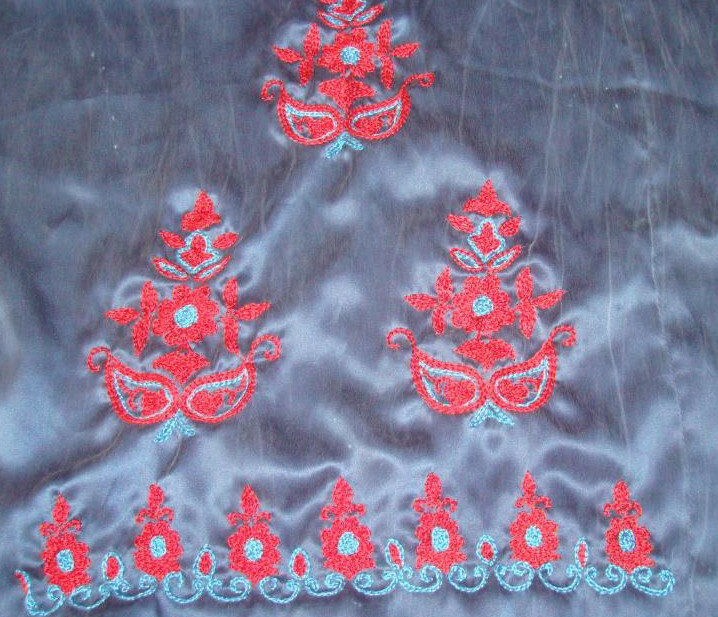 The Kashmiri embroidery is worked in open chain stitches in wool I suppose. This idea will be in action on the yoke, thus making this project more time consuming. And I am yet to get used to working without hoop. It seemed like a good idea to design another embroidery piece for a tunic while working on this tunic. While designing for a narrow border, another design idea popped into mind. Thus two pieces are ready for embroidery. The tunics are finalized and the designs will be traced after the completion of the grey crepe tunic. My friend wanted a tunic to be designed, so she can learn and work the embroidery on that. The design was ready yesterday. The embroidery is to start today. next week , I can show more light on this joint effort. Last week’s and this week’s stitches on TAST 2016 challenge were already worked earlier. So peeking on other’s samples is the general idea. Not much of progress was made on embroidery work, because we went to Chennai India for a few days. My mother is not keeping well and had to undergo surgery for broken hip. After returning on Saturday, the Randje per week 2016 challenge of this week was completed on Sunday. This week’s stitch on TAST 2016 challenge, arrowhead stitch was the one I had already worked in 2012. So not much of working required, just some browsing on facebook TAST group to see other members samples. I had started on the Kashmiri embroidery [chain stitch] on the grey tunic. This motif is on the back of the tunic below the neck. The same motif is repeated ten times more on tunic front and sleeves. A major project. The Seba designs black work pattern was used for ornament. The design was meant for cube ornament. Instead of working six times to make a cube, I worked the second design into a square ornament. This was started the previous week and completed during this week. Oval shaped red stones were attached to this black work pattern, this was not part of the design. This week’s edge on RPW2016 was completed on Saturday. The details are here. The TAST challenge has started with a new stitch, meaning, I haven’t worked this stitch before. Yet to get ideas for working this stitch.